A welcome flash of yellow, deep in the swamp! The Okefenokee National Wildlife Refuge was set aside to protect the fabled Okefenokee Swamp of Georgia and Florida. Tall cypress trees and Spanish moss give the swamp a prehistoric appearance. The Prothonotary Warbler is one of the most striking of the swamp’s denizens. Having wintered in the West Indies, a male might return to the Okefenokee and establish a breeding territory. Because it lives down in the realm of trunks and branches rather than up in the leaves, the Prothonotary has adopted an unusual nesting habit for a warbler: it nests in natural crevices or old Downy Woodpecker holes! It’s morning in the Okefenokee National Wildlife Refuge, land set aside to protect the fabled Okefenokee Swamp of Georgia and Florida. With so much water, it’s not surprising that frog calls surround us. Tall cypress trees and Spanish moss give the swamp a prehistoric appearance. Suddenly, there’s a flash of gold as a small bird hops onto a cypress knee. 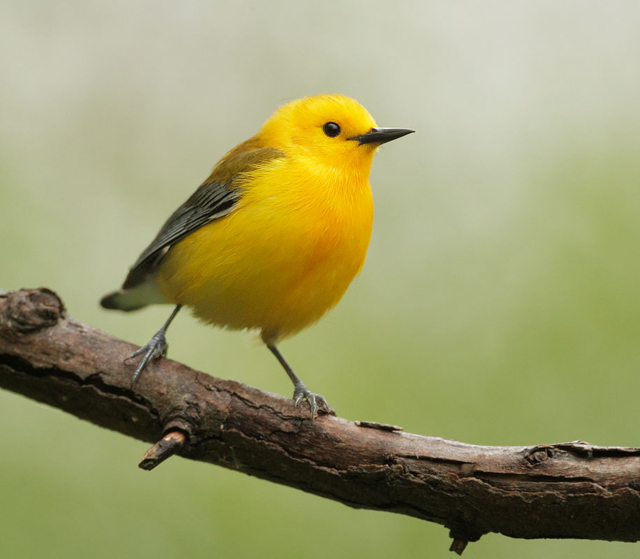 It’s a Prothonotary Warbler, one of the most striking of the swamp’s denizens. [Song of Prothonotary Warbler] Having wintered in a mangrove swamp in the West Indies, this male returned to the Okefenokee and established a breeding territory. With loud song and brilliant colors, it attracted a mate, and now has raised a nestful of young. Prothonotaries have longer bills than most warblers, and they use them to probe into tree bark and clumps of curled leaves. Swamps are productive places, and the pair of warblers easily found enough small insects to feed their brood of four. Because they live down in the realm of trunks and branches rather than up in the leaves, the Prothonotary has adopted a very unusual nesting habit for a warbler: it nests in natural crevices or old Downy Woodpecker holes! Sounds of the frogs and birds provided by The Macaulay Library of Natural Sounds at the Cornell Lab of Ornithology, Ithaca, New York; Southern Cricket Frog 81838 recorded by T. Wiewandt; song of Prothonotary Warbler 85160 recorded by W.L. Hershberger; call of Barred Owl 128933 recorded by G. Vyn.